Get tense when you try to speak. You may blink your eyes rapidly, or your lips and jaw may tremble as you struggle to get the words out. Stuttering can affect anyone. It is most common in young children who are still learning to speak. Boys are three times more likely to stutter than girls. Most children stop stuttering as they grow older. Less than 1 percent of adults stutter. Scientists don't fully understand why some people stutter. The problem seems to run in families. There is no cure, but treatments can help. They include stuttering therapy, electronic devices, and self-help groups. 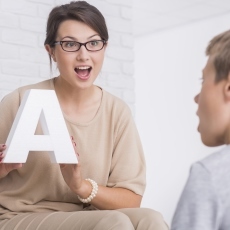 Starting stuttering therapy early for young children can keep it from becoming a lifelong problem.